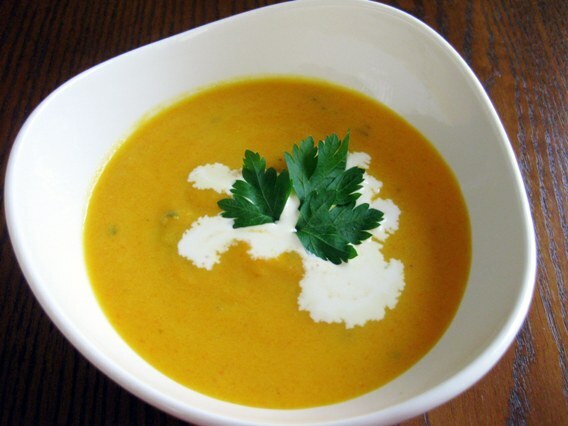 You are going to love this soup, it is crisp, fresh tasting and slightly sweet. 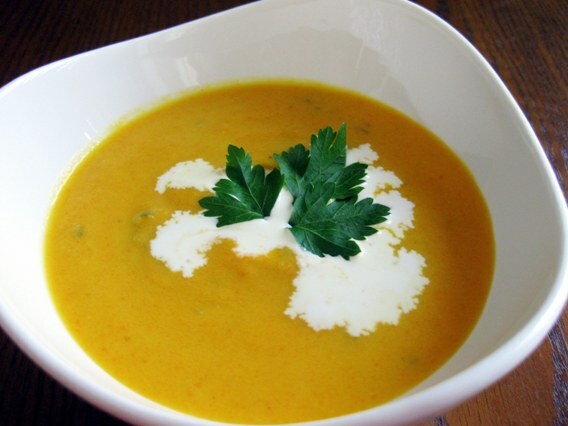 It's a great soup to serve in any weather because this soup is delicious hot or cold. The secret ingredient is the lemon juice...don't omit it because it's the magic that unites all the flavours. Enjoy! 1. Heat butter and oil in soup pot over medium low. 2. Add carrots, onions, celery, ginger and garlic. Saute until the vegetables are soften. 3. Add lemon juice, broth, water and bay leaf, cook for ten minutes at a low simmer. 4. Remove the ginger pieces and bay leaf. 5. Purée soup in 2 batches in a blender (hot liquid, be careful!) until very smooth, about 1 minute per batch, then transfer to cleaned pan and keep warm, covered. 8. Bring soup to a simmer and season with salt and pepper to taste. Add milk and chopped parsley and stir until blended and heated through. Wat a comforting bowl of delicious soup.. The combination of ginger, lemon and the sweetness of the carrots sounds amazing Paula.